Heidegger's Glasses, a novel by Thaisa Frank, Counterpoint Press, Berkeley, 320 pages, 2010, $25.00 cloth; 2011, paper $15.95. For many years author Thaisa Frank has earned well-deserved praise for her unusual literary work, much of which is fueled by a unique sense of language, as well as by those elements of the human experience which seem unfamiliar, unexplored, even surreal. Her one nonfiction work, Finding Your Writer's Voice, written in conjunction with author Dorothy Wall—presents a focus on various writers' use of the element of "voice" in their work, and the ways in which this affects the impact and uniqueness of what and how we read and write what we consider 'fine literature'. Frank's own excellent short fiction, ranging from the once-revolutionary short/short story form to a lyrical and penetrating use of the novella, similarly bears testimony to the individualistic perception and style of presentation on which her reputation has been based. Now, Thaisa Frank has published a powerful, evocative first novel, Heidegger's Glasses, which also has been released in paperback by her publisher, Berkeley's Counterpoint Press. 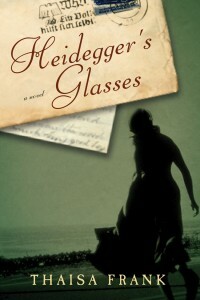 As the title of this unusual novel suggests, the plot of Heidegger's Glasses concerns two major but diverse intellectual events, each of which occurs during the lifetimes both of the great twentieth century German philosopher, Martin Heidegger, and of the man now known as one of the most prolific villains of all time, Adolf Hitler. The first event stems from the story of one of Heidegger's intellectual explorations. Inadvertently, according to legend (and Frank's exceptionally clear writing), the philosopher's eye-glasses accidentally flew off his nose one day, causing his perception of all that surrounded him to be jarred out of its comfortable range of familiarity, and to be seen only as what was: there-being, or dasein, as he writes of it later. At that moment, the philosopher's entire conception of 'reality' was irrevocably changed. Following this seemingly microscopic event, Heidegger was apparently compelled to pursue his own sense of disorientation—a raw, unlimited awareness of deconstructed "being"—for the rest of his life, culminating in the writing of his great work, Being and Time. The second event—the perceptions of Hitler and his cohorts that the issue of race, and of the "purity" of race, could be a powerful tool in the manipulation of the spirit of a people—occurred at roughly the same time. It is, in the history of human thought, certainly less profound and more destructive than Heidegger's perception of pure, unattached "being" (or as he put it, dasein). Nonetheless, Hitler's definition of "race" still bears worldwide implications and consequences, and has the power to create a climate even more powerful and disturbing than the original Nazi adaptation of Nietzsche's concept of the "übermensch." The net effect of these intertwining themes is to produce a testament, both to the ingenuity of the human mind and to the stubborn resilience of the human spirit. Frank is able to explore the ways in which even the endangered can manage to survive. With unusual, almost seamless transitions of time, place and person, she juxtaposes the drama of Heidegger's philosophical breakthrough against that of his country's racist holocaust and its myriad effects on existence itself. One of the most rewarding qualities of this book is that, no matter how strange or even implausible the situations she describes, Frank's writing bears such an absolute conviction that it seduces the reader into belief. After a brief introductory set-up of the premise for the book itself—supposedly a New York gallery showing of the works of the imprisoned "Scribes" of whom she is about to write, Thaisa Frank leads her readers into the fabricated landscape of an underground hide-out, in which even moonrise and sunset are effected only through cranking of ancient machinery, and one hundred rescued prisoners—all polyglot so-called "Scribes"—sleep on desks in an enormous room, filled with contraband clothing and stolen food. And in which they are set to writing letters in a dozen languages, which are designed to reassure the relatives of the exterminated concentration camp victims that their loved ones are still alive and well. The two main "angels" operating and providing for this underground heaven are a beautiful young woman named Elie Schacten (née Kowaleski) who specializes in rescuing endangered children; and her infatuated lover, who just happens to be the Oberst (commanding officer) of the secret, underground compound, Gerhardt Lodenstein. These two highly attractive people manage to do everything possible, not only to lighten the load of their one hundred imprisoned "Scribes," but also to help others to escape the consequences of the Holocaust to the best of their abilities. Lodenstein, despite his relatively high rank, has been convinced to participate in various acts of mercy, not just through his passion for Elie, but by his own revulsion at the torment and mayhem he witnesses around himself as the war goes on, and as increasing atrocities come to his unwilling attention. As the war itself lumbers to an end, information leaks through even to the hideaway "Scribes" that the German armies in Belgium and in Russia are faring less well than expected. Hitler is already ensconced in his bunker, hiding in what he hopes will be safety, and dignitaries arrive from the Central Office of the SS to begin to sort out the "Scribes" in their underground fantasy-world. It becomes clear that the colorful, lavish and almost mythic lifestyle of the Compound's "Scribes" is about to be terminated in gas chambers or before firing squads, as were those of all their relatives, friends, and predecessors. Or will they? As many of us know, who have encountered survivors not only of this mass tragedy, but of the many other tragedies created by the world's conflicts, Frank's book ends, not in the "final solution" posited by Germany's leaders, but with a sense of awe at the enormous number of unanswered questions and unsolved mysteries which are left behind. With the sleight-of-hand worthy of a gifted magician, Thaisa Frank forces us to confront the collision of the nature of thought—Heidegger's reality—with the nature of savage ideology, if only to evaluate and examine the impact these two forces can and have had on all our lives. 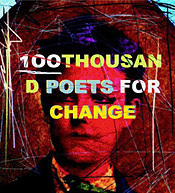 Mimi Albert is fiction editor of Poetry Flash. Her novels include Skirts and The Second Story Man. 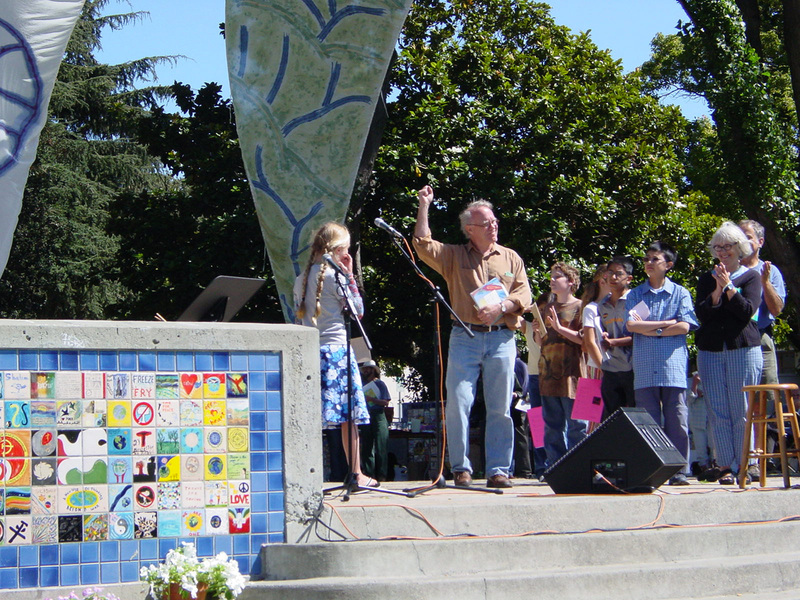 She teaches fiction writing online for UC Berkeley Extension, and lives in Oakland, California.